In terms of design and operation, the K55 and K250 represent very different approaches to Keurig’s single-cup brewing systems. The K55 is fast, and accommodates non-official Keurig pods. It comes in one color and is limited to brewing one cup at a time. The K250 is designed as a space saver, comes in an array of dazzling colors, and can brew a carafe, but it’s limited to Keurig 2.0 pods. Between the two, we prefer the K250 because it can do almost everything the K55 can do while also being more efficient in using space and more colorful. The nod here is straightforward. The old Keurigs aren’t ugly by any stretch of the imagination, but the K250 is just flat-out lovely to look at. On a very basic level, black goes with everything, and both models hit that note. But what goes even better with things is an appliance with a color scheme that accentuates your kitchen decor. On a normal day, the K55 retails for a few bucks less. There are lots of abnormal days on the Internet, depending on who is running what deal, and who has too much of something in stock and has dropped prices to move inventory. Based on the average daily price, the K55 wins. If you’re a crafty shopper, however, that advantage can evaporate faster than you can say “Black with two sugars, please.” The only addition is that if you favor generic big box-brand pods, you’ll save some extra coin. Keurig’s 2.0 line is intended to brew not just single cups of coffee, but a whole carafe. That’s pretty versatile. 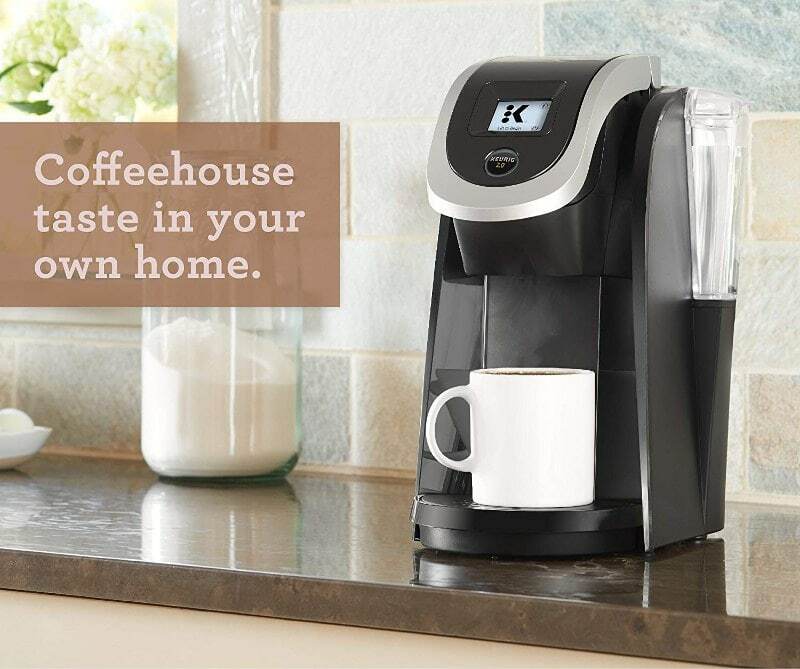 The K55, however, is designed to accept pods made by non-Keurig brands, including generics. While you can find workarounds for the K250 all over the Internet, the fact that you have to go to the trouble means that it has limited versatility. The K55 has a slight advantage in this respect. The K250 is an inch slimmer, which doesn’t sound like much until you try to fit it onto your counter without things looking cluttered. The K55 has a slightly larger water reservoir at 48 ounces, but unless you brew carafe after carafe of coffee, that’s less appealing than trying to jam its larger design into a narrow space. 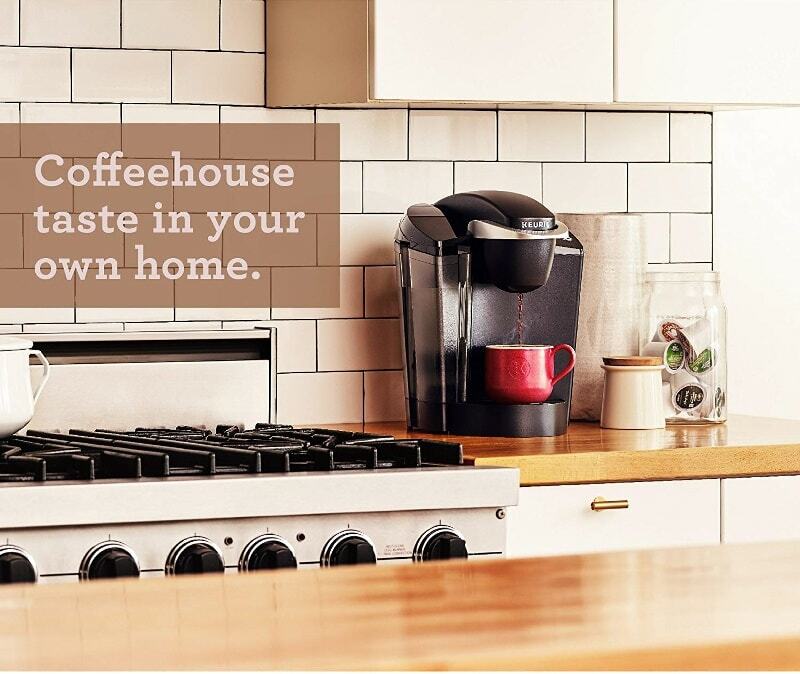 This classic Keurig is designed to do just one thing: brew a cup of coffee in a hurry. You can use generic pods in this one, which makes it a money saver and more versatile. It’s a bit bulkier, however, and only comes in one color. The Keurig K250 offers a refreshing array of colors to go with Keurig’s reputation for making great coffee. It can make a strong 10-ounce cup of coffee, a standard four-ounce cup, or an entire carafe for Sunday brunch. If you prefer to make coffee in bulk, however, be prepared to fill a smaller reservoir more frequently. It would be easy to read this and assume that there is a wide gulf of difference between the K55 and K250. At the most elemental level, however, there isn’t. Both offer a range of customization options for you to make good coffee at the push of a button, and most people who’ve used both agree. We read their reviews and have collected their insights here for you to peruse. Overall, consumers who bought the K55 liked its simple operation. You make your selections, insert a pod, and less than a minute later you have a cup tailored to your preferences. That includes off-brand pods, which for some people can be a money saver. All of that came at the expense of noise, however. If you want a cup of high-quality coffee in less than a minute, you have to expect it to get loud. Some users also reported that it’s not very durable and will stop working for no clear reason at any time. Consumers who purchased the K250 were drawn to its color options. In fact, that feature is even more popular than how well it brews coffee. But brew coffee it does, and it also offers a range of options to customize how much you want and how strong you want it. The big drawback was that it is limited to only Keurig pods. You can figure out how to use non-Keurig pods, but it means greater risk of clogging the needle. Clogged needles, based on the reviews, are not an uncommon problem for the K250. However, the naysayers represented just a small number of users for both. Most people who bought either of these models reported having great experiences because they did exactly what they were purchased to do, which is brew great coffee at the press of a button. Both the K55 and K250 have reputations for delivering quality drinks at the push of a button. They happen to go about it a bit differently. We prefer the K250’s approach, where it maximizes your counter space and comes in colors to fit your decor scheme. It can also brew an entire carafe. The K55 works with non-Keurig pods, which is attractive if you like to use generic brands, and costs a few bucks less. It’s also bigger and comes only in black.